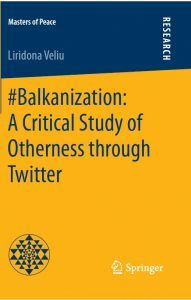 IICRR PhD student Liridona Veliu has published a book #Balkanization: A Critical Study of Otherness through Twitter with Springer Publishing. The book examines ‘balkanization’ as a long-standing discourse of identity construction, otherness and stereotyping through Twitter. Although deriving from the Balkans and attached to the Balkan Peninsula, the ‘balkanization’ discourse has gained a life of its own. Ms Veliu challenges its current manifestations shaped by the era of social media and identifies and connects its meanings with deeper processes of historical events. This book denaturalizes ‘balkanization’ as a constructed source of knowledge, approaching the topic embedded in genealogy and deconstructivism, and applies critical discourse analysis as a method of research. This book is an edited version of a dissertation written as assessment for the Master of Arts Program in Peace, Development, Security and International Conflict Transformation at the University of Innsbruck, Austria. This book is published under the Masters of Peace series. Masters of Peace is a book series edited by the University of Innsbruck’s UNESCO Chair for Peace Studies. It has been founded to honour outstanding works of young academics in the field of Peace and Conflict Studies. It is reserved for selected Master theses of the Innsbruck School and published twice a year. The Innsbruck School follows the principles of Transrational Peace Philosophy. It defines peace as a plural and regards all aspects of human nature relevant for the understanding of peace and conflict. Its applied method is Elicitive Conflict Transformation, a pragmatic approach to conflict rooted in Humanistic Psychology that entrusts the responsibility for finding alternative options of behaviour, communication and encounter to the conflict parties. Facilitators provide a safe frame, tools and methods for this quest without imposing their own solutions on the parties.